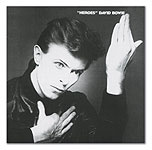 With 'Heroes', David Bowie pulled off the rare feat of having a major hit with a highly experimental piece of art-rock, which featured among other highlights live synth treatments from Brian Eno, pitched feedback from Robert Fripp and a lead vocal with level-triggered ambience. It was after working with producer Denny Cordell on a Georgie Fame session that engineer, producer and guitarist Tony Visconti relocated to London in 1968. Soon after arriving, he produced Tyrannosaurus Rex's My People Were Fair... and Prophets, Seers And Sages albums, followed by David Bowie's 'Space Oddity' in 1969. The work with Marc Bolan continued through classic records such as Electric Warrior and The Slider, while that with Bowie took in the likes of The Man Who Sold The World, Diamond Dogs, Young Americans, and the 'Berlin trilogy' of Low, Heroes and Lodger (although Low was actually recorded in France). For a short time early on, Bowie and Visconti had shared a flat in Beckenham, Kent, with girlfriends and band members, yet by the late '70s their friendship had become, to quote the producer, "more pragmatic than idealistic", while their working relationship continued to flourish. "David's way of thinking is extremely different from most human beings, while mine is very practical," Visconti remarks. "So, we got on really great in the studio." Nevertheless, after 1980's Scary Monsters (And Super Creeps), Bowie and Visconti didn't collaborate on another major new album project for more than two decades. They ended their hiatus with Heathen in 2002, and joined forces again for Bowie's most recent album Reality, as described in SOS October 2003 (read the article on-line at www.soundonsound.com/sos/oct03/articles/reality.htm). 1977 was a busy year for David Bowie. He produced Iggy Pop's records The Idiot and Lust For Life, toured anonymously as Iggy's keyboard player, made a film appearance alongside Marlene Dietrich and Kim Novak in Just A Gigolo, and narrated Eugene Ormandy's version of Peter And The Wolf. After relocating to Berlin following the release of his avant-pop opus Station To Station the previous year, he began straightening out from a coke addiction, studying art and immersing himself in Euro-expressionist, synth-based music. 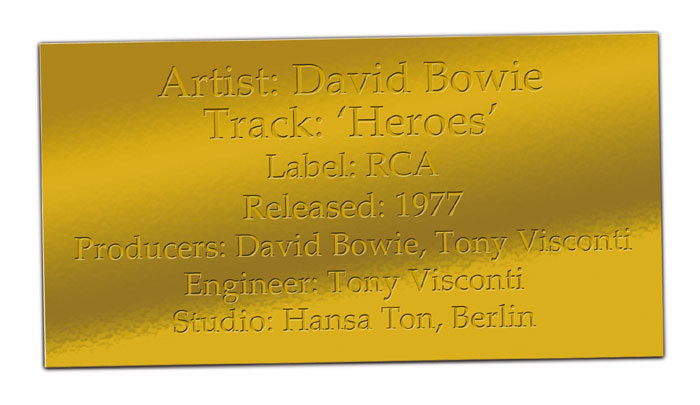 Accordingly, early 1977 saw the release of Low, Bowie's experimental and highly influential electronic album which, courtesy of his collaboration with Brian Eno — an acquaintance from Bowie's Ziggy Stardust days, when Roxy Music were his opening act — fused mainstream pop with the avant garde, and he quickly followed this up with the equally groundbreaking Heroes. Again utilising the talents of Eno, this record echoed Low 's semi-vocal/semi-instrumental structure while boasting a more heavily layered, harder-edged sound, thanks in part to the guitar contributions of Robert Fripp. In turn, the hauntingly atmospheric title track became an international hit. "Working with Bowie is much more than going to a studio," asserts Tony Visconti. "It's a social event, too. We would eat together, go to shows together, go to clubs together, and really soak in the local culture. That was always his way of working, and Berlin was perfect for him in terms of what he wanted at that time. It was a stark, scary place, yet it had a very exciting nightlife, with exotic locales such as the Turkish quarter, and it was swarming with artists like Tangerine Dream, who were friends of ours. David was writing with Brian Eno back then, and the three of us got on really great. "Since Station To Station, David had been working with a rhythm section consisting of Carlos Alomar on guitar, George Murray on bass and Dennis Davis on drums. All three were amazing musicians. You'd just throw a few chord changes at them and they'd run with it. Carlos, especially, could whip up these little instant licks that would gel the whole thing together — he's a rhythm guitarist extraordinaire, and his lead playing ain't so bad either. Bowie and he would bounce off each other brilliantly — Carlos might come up with the germ of a part, and then Bowie would help him elaborate, but once the two of them began exchanging ideas back and forth, you'd get amazing stuff. "For instance, the underlying riff on 'Heroes' was Carlos's idea, as was the pre-chorus part, which is like a viola and cello section, whereas Fripp overdubbed the high, wailing parts. 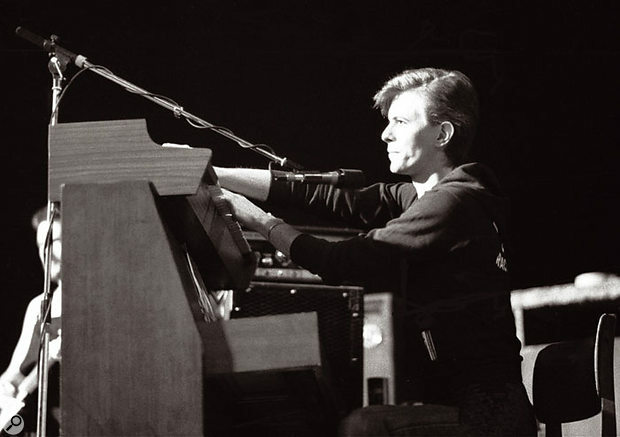 The point is, David's modus operandi would be to throw a bunch of chord changes and a bunch of ideas in a very loose structure at the band, and he knew he could rely on those guys to immediately do something. They were jam experts, and so within half an hour they would jam the few chords that David threw at them into a wonderful structure. The lyrics would often come about a month or two later. We would work on the musical content, David would have some idea as to what the song was about, and we would use that idea — like if it was going to be a happy song or a depressing song — to make the instruments come out with an emphatic arrangement or sound in order to invoke the desired emotion. Then the stage would be set and David would just throw his lyrics on at the very last minute. He would write his lyrics in a morning, it would take him an hour or two, but beforehand he'd also need a month or two to let the ideas really germinate." Such was the case with 'Heroes'. 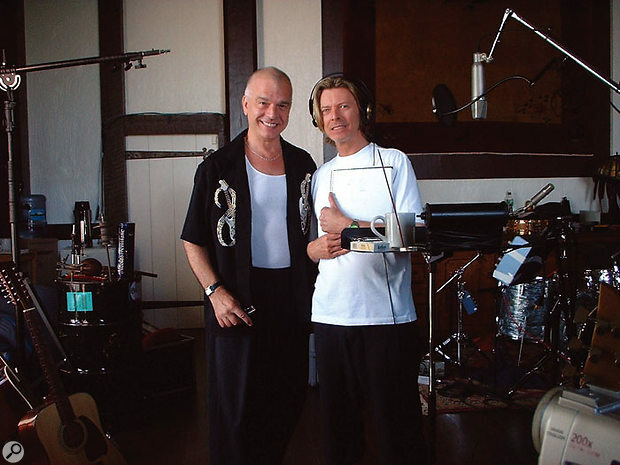 Before recording commenced on the album, Bowie and Eno spent a couple of weeks working out some basic song structures, but again there were no lyrics and no melodies. 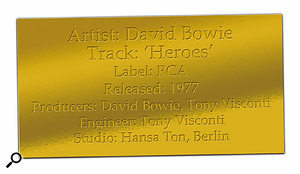 One of the stronger structures was that which would evolve into 'Heroes', yet whereas the finished version clocks in at just over six minutes, the track was actually about eight minutes long when it was recorded. Visconti and Bowie during the making of the Heathen album at Allaire Studios in Shokan, NY. Photo taken by assistant engineer, Brandon Mason. "We just kept going round and round with these very long cycles of verse, two verses and then pre-chorus and chorus," Visconti recalls. "Then, about four minutes down the line, a bridge kicks in. When you record in this fashion it's inevitable that you bring out the razor blade, and if you looked at a lot of the Heroes multitrack tapes you'd see loads of edits. Most of the tracks on that album had to be cut down as we would just over-record, but sometimes it would be useful to do that because we'd find, for instance, that there was a better chorus at the end. I would make a 24-track to 24-track copy and edit that chorus earlier because it was played better or whatever. This was before Pro Tools! And it was dangerous living, because you couldn't do too many edits on the same point without the tape starting to curl up or the backing coming off. You had a maximum of, say, two edits that you could do and undo in the same area, but we firmly believed that if you didn't do it, it wouldn't be worth keeping the track anyway. So, living dangerously wasn't that dangerous really." Having completed his contribution after about two and a half weeks into recording of the Heroes album (representing the first third of the project), Brian Eno departed, and at that point it was a case of 'What shall we do next?' for the co-producers. Among the answers was a sound resembling a Stax horn part that surfaces at the start of the title track's second verse. As it happens, this was a brass patch out of a Chamberlin, successor to the fabled Mellotron, which Bowie had first employed on the Diamond Dogs album and which now provided a cheap and instant — if less desirable — alternative to real-life sax and trumpet players. "It was definitely written as a trumpet part, but it sounds more like a weedy little violin patch," Visconti admits. "Still, we liked it in the end. We just said 'Oh, that'll do,' because it sounded weird." In line with this way of thinking, when the two men wanted to add a cowbell and didn't have one immediately to hand, they sufficed with an empty tape reel of the German variety; a metal plate on which the tape basically sits. 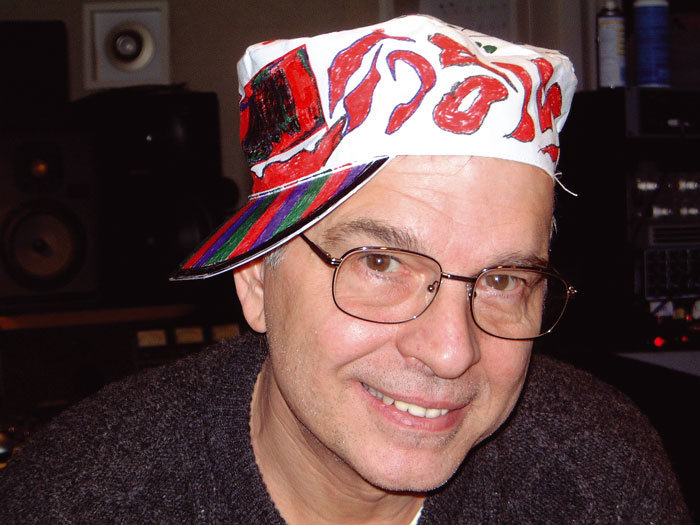 The echoey result of David Bowie and Tony Visconti alternately bending it out of shape with a drumstick was achieved not using artificial reverb, but by miking it in the large room at Hansa. "It was really painful to hold it, because it's not ergonomic like a cowbell," Visconti recalls. "When I have a big room, I use that room's sound, and we had an 87 in there that picked up all the ambience — the 87 is my Swiss Army Knife microphone, I use it for everything. Sometimes, I'd try to use two mics, but again it was a sheer luxury to have two tracks for ambience. If I mixed that record in 5.1 today I would certainly have that ambient mic in the back speakers, conveying a sense of the room's size which stereo can't reveal. "Anyway, we played the drum reel, as well as a tambourine that was the other percussion instrument, about 15 feet from the mic to ensure we got all that room sound. It's like a gift to be in a room like that, and I would not only use the ambience for percussion but also throw a guitar out there and have a close mic on the amp. I suspect I may have used that sound during the mix, too, because the room served as a real echo chamber. You just throw the sound out there via the board — you take an auxiliary send and send it through a speaker in the room, and then have a microphone at the other end of the room picking up the sound which is brought back into the board as an effect." One of Bowie's most hypnotic recordings, 'Heroes' draws in the listener by way of a multi-layered rhythm, while the vocalist builds from a low croon to near-hysteria. The aforementioned live trio of Alomar, Murray and Davis was augmented by Bowie on piano, the band remaining in Berlin for about 10 days as per the norm for his projects. 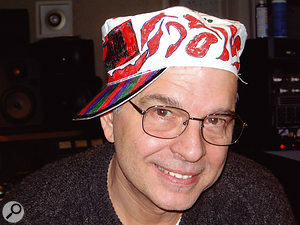 Tony Visconti "in a house painter's hat decorated with Sharpies by my 11-year-old daughter, Lara. It was taken in studio B of Looking Glass during the making of the Bowie album Reality. David refused to wear the hat. "Photo: Tony Visconti"David likes to do these backing tracks, he gets very enthusiastic about them," Visconti explains, "but we send the band away very quickly and maybe keep a person like Carlos for an extra day or two so that we can double-track some of his parts. With 'Heroes', on the other hand, we built the track over the course of an entire week of careful overdubbing. For instance, Brian brought his EMS Synthi with him, which is a synthesizer built in a briefcase, and it has no real keyboard — it's got a kind of flat, plastic keyboard which Brian very rarely used. He used the joystick a lot, and the oscillator banks, and he would do live dialling — they look like combination-safe rotary knobs on the three oscillator banks. Brian goes down on record as saying that he's a non-musician — he even tried unsuccessfully to have that listed as his occupation on his British passport — and, like David, he thinks very radically and from a completely different space. "So, after recording the live rhythm section, everyone went home and a week later we came back to this track that was tentatively called 'Heroes', and Brian took out the EMS Synthi and got this shuddering, chattering effect by using oscillator 1 at a very, very low frequency rate — probably five cycles per second — and working the noise filter. He would slowly change the speed or change the intensity with other knobs, and he did that in a couple of passes of the tape, which by now had been edited down to just over six minutes. If you listen to the track now, this shuddering, chattering effect slowly builds up and gets more and more obvious towards the end, and that kind of set the mood. "Then I'd say the next thing that really moved the track along was Fripp's contribution. We already had Carlos's beautiful lines, like the bass line that was doubled on the guitar as well as the melodic part on the pre-chorus, and when Fripp came along about a week later he added a whole other dimension. He and Eno had already enjoyed a long partnership where Fripp would plug his guitar into the EMS Synthi and Brian would just play around with it, so Fripp did exactly that and he came up with that beautiful line which everyone thinks is an E-bow sound, but which is actually just Fripp standing in the right place with his volume up at the right level and getting feedback. "Everyone who's played the song with Bowie since then has had to use an E-bow to duplicate it, but Fripp had a technique in those days where he measured the distance between the guitar and the speaker where each note would feed back. For instance, an 'A' would feed back maybe at about four feet from the speaker, whereas a 'G' would feed back maybe three and a half feet from it. He had a strip that they would place on the floor, and when he was playing the note 'F' sharp he would stand on the strip's 'F' sharp point and 'F' sharp would feed back better. He really worked this out to a fine science, and we were playing this at a terrific level in the studio, too. It was very, very loud, and all the while he was playing these notes — that beautiful overhead line — Eno was turning the dials and creating a new envelope and just playing with the filter bank. We did three takes of that, and although one take would sound very patchy, three takes had all of these filter changes and feedback blending into that very smooth, haunting, overlaying melody which you hear." The layout of Hansa Studios for the Heroes sessions. In Visconti's own words: "The studio was large, symphony size. The choir riser was about a metre and a half higher than the studio floor, so George Murray could hear and feel the kick drum in his face, without headphones. The bass and guitar amps were covered with gobos, as was the grand piano. No gobos were used for the drums and an ambience mic was placed at the far end of the studio, opposite the drums. 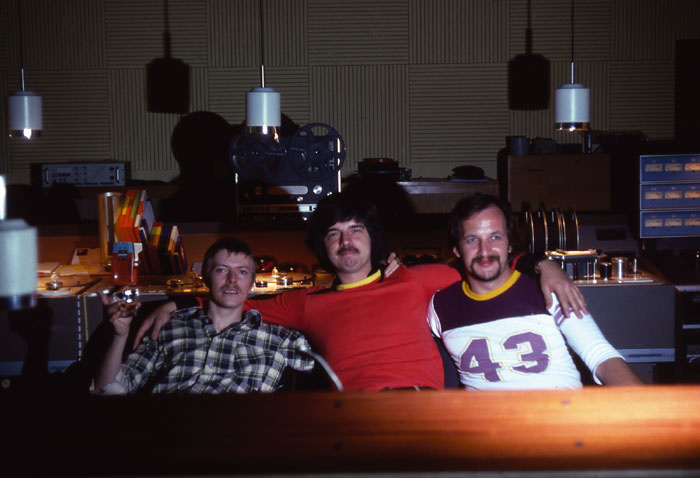 "Positioned behind the Neve console in Hansa's Studio Two, Tony Visconti was taking care of the recording while also throwing in his two cents' worth of production advice regarding the evolving arrangement and whether or not things were in tune. With the levels fluctuating wildly, he had to employ heavy compression as part of his chain of effects, while the 24-track medium necessitated a considerable amount of bouncing down. "When you're doing filter sweeps on an oscillator, especially in the mid-range, you'll suddenly have a bump of maybe 15dB," he explains. "Then, when you're boosting the lower frequencies, depending on what your EQ is, the sound might go away, so all the while I was putting everything through my processing gear just to get it on tape. At the same time, given what was on that track, I had to do some bouncing. For instance, even though there were three Fripp tracks, I had to bounce them to two because in those days you always knew that down the line you were going to need more tracks. The same went for drums. Back then I'd record them over eight or nine tracks, but then I would do a submix down to six, putting all of the toms to two tracks. So, that's what I was doing the whole time, knowing that this song was going to get bigger and bigger, and trying to figure out how I'd record this stuff while imagining how it would sound in the mix a couple of weeks later. I'd be sitting there and thinking 'I hope I've got these levels right, and I hope this guitar is balanced correctly to this guitar,' because once I'd bounced them down they were locked." In line with these concerns, it was natural for Visconti to basically mix as he went along, making decisions on the spot with regard to level changes that would theareafter be irrevocable. "It was fun, and Bowie loved to work that way," he remarks. "He'd say 'Once I've made up my mind, I don't want to change it.'" Between Bowie, Visconti, Eno and Fripp, everything was done by committee, with each person throwing in suggestions that might contribute to the final product. It was the producer/engineer's idea, for example, to triple-track the guitars in order to smooth out a sound that was patchy on the first pass. "When the song was first recorded, we had no idea what a verse and chorus were," says Visconti. "If you listened to it, the verse could have easily been a chorus, because it had a hook to it, but that was slowly evolving as we were overdubbing these instruments. Those guys are real artists. They're truly imaginative throughout the whole process, and nothing is done for the sake of it. 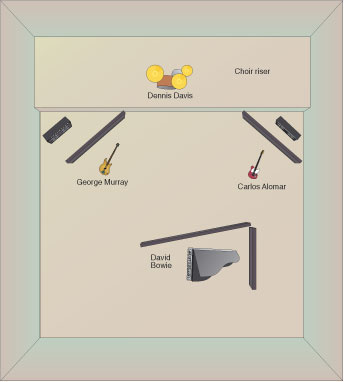 You know, with Bowie you don't double-track a guitar because you have to. It has to have a meaning for him in order to do that, and quite often he likes things to remain single-tracked. I mean, the Beatles didn't double-track everything — sometimes they had one guitar, but it would be at the forefront of the mix, providing a very important, very solid sound, and double-tracking or triple-tracking could have weakened that. However, in the case of Fripp, we wanted this dreamy, floaty effect, so triple-tracking had a purpose. And of course it was inconvenient, because I only had 24 tracks to play with. Bowie, Visconti and assistant engineer, Edu Meyer, taken in the control room of Hansa Studios. Photo by Edu Meyer's wife, Barbara. "Sometimes in those days, if we had something ridiculous like 16 voices and we only had two tracks left, we would do a slave mix on another piece of tape, mix the 16 voices to a two-track tape, and then fly that in by chance to the spot where it belonged. I'd achieve this by having my assistant — in this case an invaluable German engineer by the name of Edu Meyer — start the multitrack while I'd make little marks on the two-track tape and just hit the Play button, hoping this might be it. And if this was not it, then I'd move my mark on the tape and try again. No one had yet devised the system of sync'ing up two multitrack machines. "Tape was often rolling all the time. We would have a two-track tape running at 7.5ips, and it came in handy many times when searching for that moment of inspiration. You'd go back an hour and there it was! Beforehand, we'd be talking about it, saying 'Gosh, I'm sure you were onto something earlier,' because we'd get lost. We'd start with an idea and then we might go in the wrong direction, and after an hour we'd say 'How did this start out again? It sounded good an hour ago. Why are we not getting that?' So, we'd often have that tape running, and if we went back and heard something we really liked, it could be duplicated. Of course, we couldn't lift it off the 7.5ips tape — it was in the mix, but at least the musician could replay it." For all the sonic experimentation on display, very few effects were employed during the recording, not even the Eventide Harmonizer which Visconti had applied to live drums on Low after memorably informing Bowie and Eno that "it fucks with the fabric of time". Visconti only used it when mixing some of the Heroes album, and not the title track itself. "It was enough to hear the sound of that large room on the drum kit," he explains. "The studio, which had been used to record symphonies during World War II, could accommodate about 150 musicians, and there was a stage which was probably a riser for the choir. It was at one end of the room, and we used that for Dennis Davis's drum kit. In those days, we'd usually put a drummer in a booth, but Dennis took advantage of all the space, and besides his tom-toms he sometimes had an extra snare, a set of conga drums and a single timpani. When that was the case, he'd often go around his kit, and as he was doing a tom fill he'd also play a few beats on the conga drum and a few beats on the timpani. So, although those fills may sound like overdubs, that's actually Dennis Davis playing live. He's a wacko guy, one of the best drummers I've ever worked with. 'Heroes' wasn't played to a click track, but its tempo is virtually the same throughout the entire six minutes, and that's thanks to Dennis. He's not only an innovative drummer but a human metronome, and he's also a jazz guy who never plays the same thing twice. Some of his fills were priceless — on the song 'Blackout', you'll hear a lot of those fills going right around the kit, from the toms to the conga drums, whereas on 'Heroes' he was a little more sedate." One of the unusual features of the final mix on 'Heroes' is that the kick drum is almost inaudible. This, as Tony Visconti explains, was entirely deliberate: "You see, the track seemed to plod, and at the mix, I realised that when we played it with the kick drum lower it had more of an energetic feel to it. Usually, the kick drum is to the fore in the mix and equally loud as the snare, but we discovered that, by pulling back the kick drum and emphasising the bass guitar, the song had more of a flow and a better forward energy, while the shuddering effect [created by Eno's synth playing] was another tempo element that helped it move along. So, this was one of the very tracks that I've ever mixed with almost no kick drum in there, and that was entirely intentional because it made all the difference in the world." Less than sedate, when it came time to write the lyrics, was Bowie. "He gets very, very tense," Visconti confirms, "because he's now got to commit. So, I could feel it in the air." And the producer/engineer soon got a breath of fresh air when the main man asked him to take a break in the middle of the day. Happy to oblige, Visconti went for a walk by the adjacent Berlin Wall with backing singer Antonia Maass, and this couple then unwittingly aided the songwriting process by indulging in what they thought was a spot of covert smooching. "David could see us, and we quickly got written into the lyrics as the lovers who kissed by the wall," Visconti admits. "He wrote the entire lyrics looking out through the windows of Hansa Studios, and when I returned after a couple of hours and asked him how it was going, he said 'Oh, I've finished.' His assistant, Coco Schwab, then took me aside and said 'I think you and Antonia are in the song.' I was married at the time, so this story was never allowed to be made public, but I don't mind now. "Anyway, David then told me he was ready to record his vocal, and after we did a couple of run-throughs during which he wasn't sure where to place the octave, we eventually came to the conclusion to sing the first two verses down an octave and the rest of the song up an octave. That was another good way of building up the track, and it prompted the break in his voice which he himself calls 'Bowie histrionics', where he has to put everything into it in order to hit those high notes. It's right at the end of his range. "My input at this point was to suggest using the room on his voice and drop the conventional method of just singing into one microphone. He agreed, and so I set up three microphones. We only had two or three tracks left, and I needed one of these for backing vocals. I couldn't even bounce down, and so we'd snookered ourselves. Therefore, even though I would have ideally loved to put each mic on a separate track — enabling us to capture the whole room when he sang loud, and just that one mic right in front of his face when he sang quietly — I put gates on mics two and three. Mic number one was in front of him with fairly heavy compression, because I knew beforehand that he was really going to shout, and it all went down to one track. This was recording by the seat of your pants, and Bowie was thrilled with the idea that I wanted to do something unique. He thrives on anything that's different and someone else hasn't thought of yet, and I just thought 'Let's do this live,' because he's a great singer and he could always sing it again if I made a mistake. That's the luxury of working with him: he's consistently good when he sings. He's in tune, he's passionate, and he delivers an arena-type performance every time. "Mic number one was a valve U47, and with the other two on gates I made sure that number two, an 87 placed about 15 feet away from him, would go on at a certain level, while the third mic, another 87 that was all the way at the other end of the room, didn't open up until he really sang loud. That reverb on his voice is therefore the room itself, none of it is artificial, and it's his voice triggering the gates. What is really great is that the sound of the opening two verses is really intimate. It doesn't sound like a big room yet, it sounds like somebody just singing about a foot away from your ear. The whole idea worked, and what you hear on the record is probably take three. We wouldn't go beyond that. He was really worked up by then and I can tell you he was feeling it. It was quite an emotional song for him to sing, he deliberated long and hard over these lyrics, and he was ready to go, there was no holding him back. We probably punched in a few things, but it's pretty much a complete take save for a couple of notes that he redid. "This was immediately after he'd written the lyrics, and immediately after this he said 'Come on in, let's do backing vocals.' You see, I'm his utility person — if there's a guitar part that needs to be played and there's no guitarist in the studio, I'll play it, and the same goes for bass guitar, keyboards and singing. So, Bowie and I performed the two tracks of backing vocals on that song, meaning that writing the lyrics, singing the lead vocal and then the backing vocals was all done within the space of about five hours. That doesn't always happen, and since then I've regretted telling this story to other groups I've worked with who think they can do the same thing. Very few people can write the lyrics on the spot in the studio and then perform a great vocal in just a few takes. Bowie's one of the few people on this planet who can actually pull that off."